In the world of comics, “retcon” is short for retroactive continuity. Anytime a comic book writer wants to fix or explain inconsistencies in previous stories by revealing new information about them, it’s what we refer to as a retcon. Sometimes this is done to great effect, like we will discuss with Green Lantern: Rebirth, and sometimes it’s Sins Past. The first attempt to make Hal interesting was to give him gray temples, because all the kids love Mr. Fantastic, or something. This didn’t work, so DC decided to completely replace him, probably because they had achieved such success with Wally West taking over for Barry as The Flash. Following the destruction of his hometown and base of operations, Coast City, Hal went a little crazy, murdering a bunch of Lanterns, killing Sinestro, destroying the Central Power Battery, and ultimately renaming himself Parallax and almost extinguishing the sun. (Or something to that effect, I’ve never read those comics.) Hal gave his Green Lantern ring to his best friend Green Arrow, for safeguarding. Hal was replaced by a fresh young new character, Kyle Rayner, who took over as the sole Green Lantern in the universe. His new ring came without that fairly silly weakness to the color yellow, because why not. Kyle had his fans, mostly thanks to a memorable stint on the Justice League as part of the classic Grant Morrison JLA run. However, comic fans are really opposed to change, especially when it comes to 40 year old characters they grew up watching in Saturday morning cartoons like Super Friends. 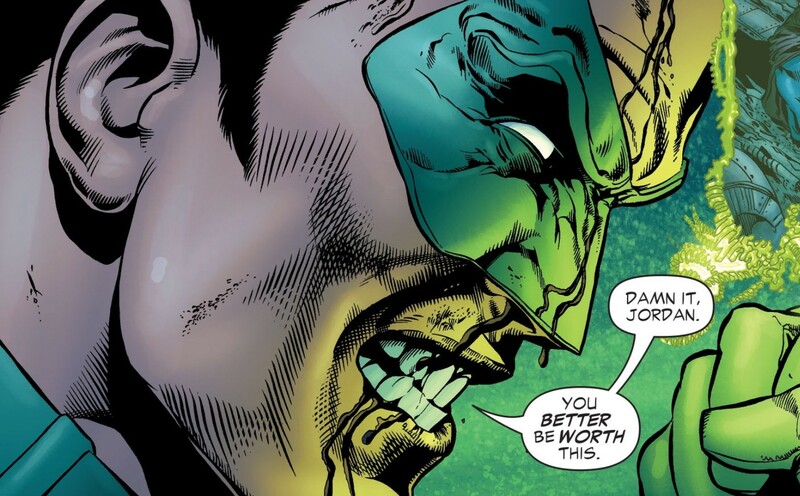 An online petition was created to bring Hal Jordan back. 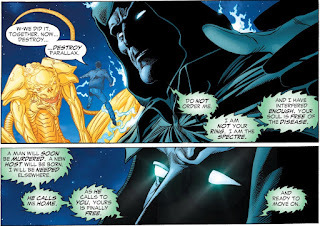 In the years since he had died, they made Hal the new host for the Spectre, most likely in an attempt to appease the Hal fans, but it wasn’t enough. The main problem with bringing Hal back was they had so thoroughly ruined his character, it was going to be a real challenge to make him a hero again. Geoff Johns (who based on his body of work is clearly a fan of the Super Friends) was up to the challenge. Therefore, the task could be broken down into these distinct requirements: redeem Hal for his murderous atrocities, separate him from the Spectre and restore him to life, and do all this without alienating Kyle Rayner fans. As Kyle himself would say, Hal better be worth it. 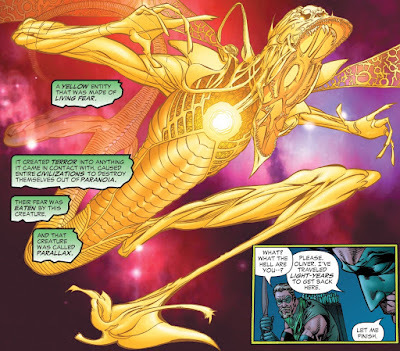 In the story, Kyle Rayner has returned from deep space with a stunning discovery, an ancient alien society with a story about a yellow entity made of living fear named Parallax. It turns out, there is an emotional spectrum that manifests itself into energy represented by different colors. The yellow light of fear was consolidated into this being called Parallax. The Guardians harnessed the green light of willpower, the opposite of fear, and trapped Parallax inside their central power battery. When they used the battery to create their space lantern corps, the rings had a weakness to yellow, because of the entrapped fear entity. However, Parallax eventually woke up and discovered Hal Jordan. His creeping influence initially took hold subtlety, with the graying of the hair on Hal’s temples (this is a truly inspired and thorough retcon) but after the destruction of Coast City, Parallax had firmly taken over Hal, and the villain Parallax was born. This was a truly stunning retcon, all at once explaining the yellow impurity, Hal’s graying temples, and effectively making Hal a pawn in his previous atrocities. This also set up the lantern color spectrum, with other corps established for red rage, compassionate indigo, greedy orange, blue hope, black death, white life, and violet love. Suddenly, Green Lantern went from having a really weak rogues gallery, to an entire universe full of colorful allies and foes. Again, the way Geoff linked up all these disparate facts and wove them all into one effective explanation, not to mention a compelling story, is simply amazing. Now Hal Jordan could effectively return without fans having to reconcile enjoying new adventures starring a former mass-murderer. When Parallax had sacrificed his life to reignite the sun and save his friends, they gave him a proper burial and shot his body into the sun. (Or maybe he reignited the sun using his body, who knows. Don't ever read Final Night.) This presented a distinct problem in returning Hal to life. 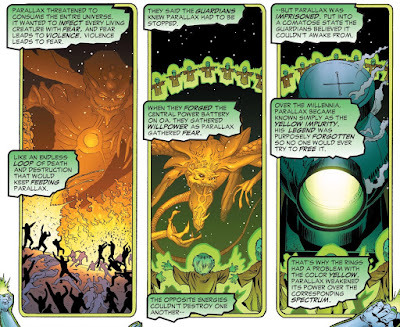 Therefore, after Kyle discovered the truth about Parallax, he and Ganthet retrieved Hal’s body from the sun, still intact thanks to the possession of Parallax. Parallax and the Spectre battled for the soul of Hal Jordan, with Hal finally breaking himself free from the fear entity’s grip. The Spectre, having now fulfilled its secret mission all along, disappeared to find a new, more suitable host. Hal almost succumbed to the warm glow of the afterlife, but was pulled back by the green energy, reclaiming his ring from his friend Green Arrow and becoming a Green Lantern once again. The mini-series also returned Sinestro to life, which was a very wise move. He had been a bit of a joke in the past, with his giant oblong head and funny mustache, but they would minimize those features moving forward. 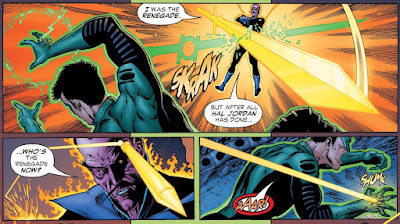 When I learned that Kyle Rayner had never once fought Sinestro in his run as the only Green Lantern, I was really surprised. You never want to try to sustain a series without your marquee villain, especially an evil twin. Under the stewardship of Johns, Sinestro would become a truly fantastic character. GREEN LANTERN: HAL OR KYLE? DC’s biggest problem in bringing back Hal Jordan was they never wanted to split their fan base and make them choose between him and Kyle. Turns out, an intergalactic corps of space cops never needed to have only one representative in the realm of comics. John Stewart was shown to already still be a Green Lantern at the beginning of the story. During the course of the mini-series, Guy Gardner’s Warrior (don’t ask) powers went nuts, until Hal’s old ring duplicated itself and restored Guy as a Lantern again. Kilowog was also suddenly back from the dead (or maybe he was already back, or never dead in the first place, I don’t know). They were soon followed by a full cadre of the Guardians, back from the dead (or vacation, who knows) as well. 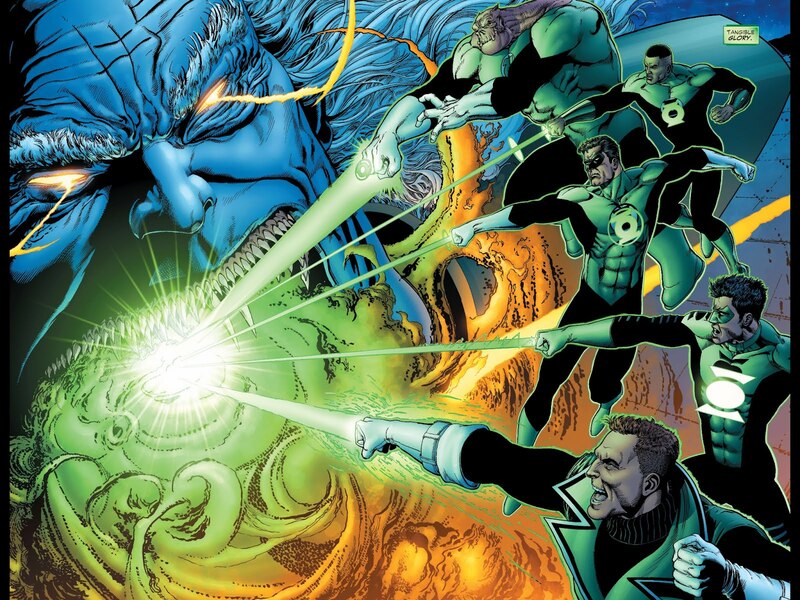 Together with the restored Hal Jordan, they now had a solid core group of characters to restart the Green Lantern Corps. Not only had Geoff Johns successfully fixed the mistakes of the past, they created a wealth of story opportunities going forward. 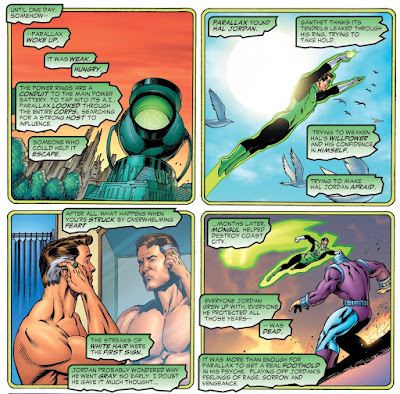 Hal Jordan had been redeemed in the eyes of the readers, but not necessarily in the eyes of the characters of the universe he inhabited, which provided plenty of story opportunities. 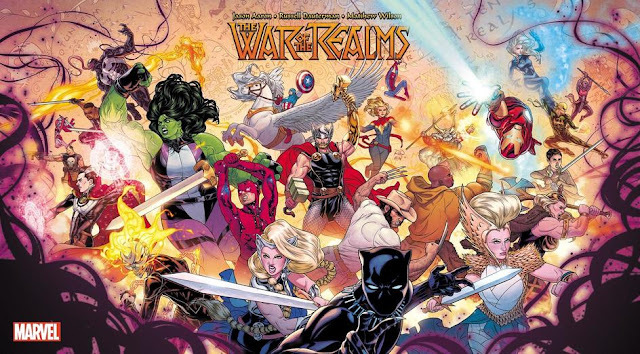 The idea of the emotional light spectrum would provide a highly marketable and entertaining roster of new characters. Finally, Hal may have been picked to be the one to headline his own book, but the much more interesting Green Lantern Corps series was launched alongside it. The new book featured the other established Lanterns, plus a whole squad of great new recruits (Soranik Natu was my favorite). Following this monumental mini-series, Green Lantern would achieve a level of critical and commercial success it had never before experienced as a franchise. 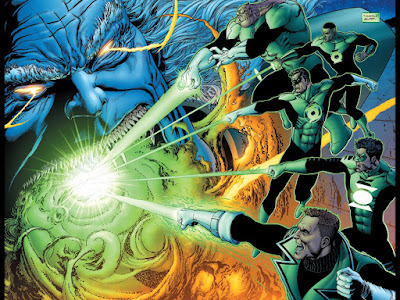 Blackest Night and Brightest Day were linewide DC events that spun out from the Green Lantern books. Little plastic colored rings were used as comic book retailer incentives for ordering certain books, and fans scrambled to collect them all. The character became so popular that Warner Brothers even made a Green Lantern film starring Ryan Reynolds. That was less successful, but the fact it was even made is a testament to the movement that Geoff had begun. Considering all of that information, this makes Green Lantern: Rebirth the gold standard of retcon stories, and my initial entry into my completely made-up Retcon Hall of Fame. It will be a hard act to follow. Next up, not Sins Past! Indeed. And the different lantern corps are such an obvious idea in retrospect, it's kind of amazing it took so long to happen. I think the "Hank Pym used his own brain tapes for Ultron" is another retcon that fits in very well.